The film is an American-German co-production that was financed by German financial companies and film-funding organizations and filmed in Germany. The Grand Budapest Hotel released to widespread critical acclaim and was financially successful, grossing about $175 million worldwide on a $25 million budget, and was included in several critics' year-end top-10 lists. The film won the Golden Globe Award for Best Motion Picture – Musical or Comedy and garnered three more Golden Globe Award nominations, including Best Director for Anderson. It was nominated for nine Academy Awards, including Best Picture and Best Director for Anderson, and won four Oscars for Best Costume Design, Best Makeup and Hairstyling, Best Production Design and Best Original Score. In a 2016 BBC poll, several critics voted the film the 21st greatest film of the 21st century since 2000. In the present day, a teenage girl approaches a statue in a courtyard. In her arms is a memoir by "The Author." She begins reading about a trip he made to the Grand Budapest Hotel in the late 1960s. He discovered that the nearly deserted hotel, located in the Republic of Zubrowka, a nation ravaged by war and poverty, had fallen on hard times and become dilapidated. The Author meets Mr. Moustafa, the hotel's owner, who tells him over dinner the tale of how he took ownership of the Grand Budapest and why he is unwilling to close it down. The owner's story begins in 1932 during the final years of the hotel's glory days. Zubrowka is on the verge of war but this is of little concern to M. Gustave, the Grand Budapest's devoted concierge. When he is not attending to the needs of the hotel's wealthy clientele, managing its staff or training the new lobby boy, Zero (a younger Moustafa), Gustave courts a series of aging, blonde women who all flock to the hotel to enjoy his "exceptional service." One of these, Madame D, spends the night with Gustave prior to her departure. In prison, Gustave befriends a group of hardened cons who include him in their escape plan. With the aid of Zero's new fiancée Agatha, the group escape the maximum security prison. They part ways and after a tense heart-to-heart, Gustave enlists Zero to prove his innocence. Their adventure takes them to a mountaintop monastery where they meet with Madame D's butler Serge X, the only person who can provide Gustave with an alibi for the night of Madame D's murder. However, Serge is murdered by J.G. Jopling, Dmitri's henchman. Zero and Gustave steal a sled and chase Jopling as he flees the monastery. During a clash on the edge of a cliff, Zero kills Jopling, saving Gustave's life. Zero and Gustave return to the Hotel, which the military has commandeered as war has just broken out. They find that Dmitri has also appeared, chasing Agatha, who was entrusted with the painting. A chase and a gunfight ensue, and a different version of Madame D's will is discovered hidden in the painting by Serge X, in which she bequeaths her entire fortune, including the Grand Budapest, to Gustave in the event that she should be murdered. Dmitri disappears afterwards, as Zero marries Agatha. During a train trip, soldiers search Gustave's carriage and he is killed while trying to protect Zero. A heartbroken Zero vows to continue his legacy at the Grand Budapest, but the ongoing conflict and the ravages of time took their toll. Agatha succumbs to a disease and dies a few years later. Zero admits to the Author that he cannot bring himself to close the hotel because it is his last link to Agatha. The Author later departs for South America and never returns to the hotel again in his life. The hotel is eventually demolished, though Zero's ultimate fate is left unknown. Back in the present, the girl continues reading the author's story about the Grand Budapest as the film ends. Anderson and Guinness' story was inspired by several works by the Austrian writer Stefan Zweig, particularly the novella Twenty-Four Hours in the Life of a Woman (1927), the novels Beware of Pity (1939) and The Post Office Girl (1982), and his autobiography The World of Yesterday (1934–42). Wes Anderson suggested editor Barney Pilling watch Ernst Lubitsch's The Shop Around the Corner and the films of Jacques Tati as references. In 2012, it was rumored that Johnny Depp was in the film, but Anderson later denied the rumor in an interview with the Huffington Post. Tilda Swinton replaced Angela Lansbury as Madame D. when Lansbury was unavailable due to commitments with a theater production of Driving Miss Daisy. Casting the character, Zero, proved to be difficult, as casting director Douglas Aibel was in search for "a relatively unknown teenage boy, preferably of Arabic origin, to carry the role". Tony Revolori got the part by sending an audition tape. It was filmed for the most part on location in Germany, mainly in Görlitz and other parts of Saxony, as well as at Studio Babelsberg. Principal photography began in January 2013 on location in Berlin and Görlitz. One of the principal locations was the defunct Görlitz Department Store, a huge Jugendstil department store with a giant atrium, one of the few such department stores in Germany to survive World War II. It served as the atrium lobby of the hotel. The widow's mansion was filmed partially within Schloss (castle) Waldenburg. Filming concluded in March 2013. Anderson shot the film in three aspect ratios, 1.37, 1.85, and 2.35:1, one for each timeline. For wide shots of the hotel, Anderson used a three-meter-tall (10 ft) handmade miniature model, as he felt that audiences would know that the shot was artificial, computer-generated effects or otherwise, commenting: "The particular brand of artificiality that I like to use is an old-fashioned one." He had previously used miniatures in The Life Aquatic with Steve Zissou and more extensively in Fantastic Mr. Fox. In designing the hotel, Anderson and production designer Adam Stockhausen did extensive research, looking at vintage images at the Library of Congress of hotels and European vacation spots. Also visited were existing locales such as the pastel-pink Palace Bristol Hotel and the Grandhotel Pupp, both in the spa town of Karlovy Vary (Carlsbad), Czech Republic as well as the Grandhotel Gellért in Budapest, Hungary. The model used was a composite of these different real grand hotels and multiple props in varying scales were made: the model represented a scale measurement of 4 meters (14 ft) long and 2 meters (7 ft) deep, the tree-spotted hill on which it stood was a different scale, and finally the funicular railway in the foreground was built to a third scale to capture it best cinematically. The painting in the film, Boy with Apple, supposedly a Renaissance masterpiece by one Johannes Van Hoytl the Younger, is a fictional piece commissioned by Anderson and painted in four months by contemporary painter Michael Taylor. Likewise the much sought after pastry, Herr Mendl's courtesan au chocolat, is a humorous fictional creation of Wes Anderson's, as a symbol of the courtesan lifestyle of the concierge, the triple tier form of the story, and as an element to escape prison. The bespoke pastry was produced by a local baker in Görlitz. The brief was to come up with something related to a classic religieuse, which is French for 'nun', with chocolate covered stacked profiteroles resembling a nun in black robes. 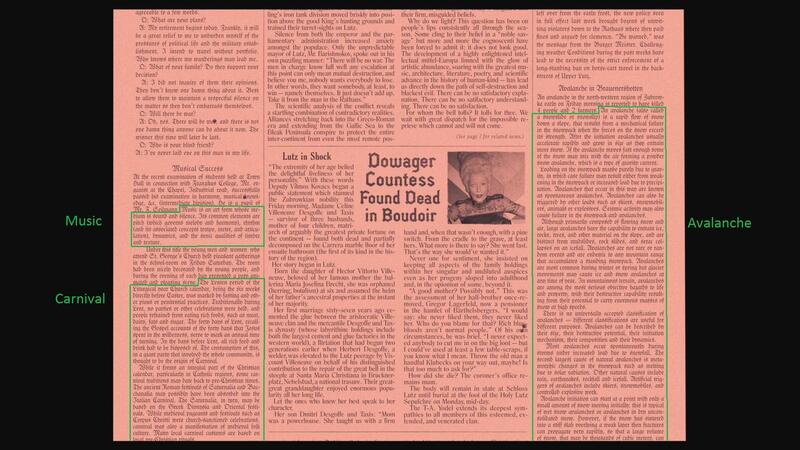 The fake newspapers in the film feature mainly original text, but also use some excerpts from three Wikipedia articles. According to Robert Yeoman, filming proved to be difficult because natural light lasted between seven and a half or eight hours and the film stock was slow. The crew solved those problems by working faster through the day to get the shots. The visual effects in the film were created by the German company LUXX Studios. The Oscar-winning soundtrack is composed by Alexandre Desplat, who worked with Anderson previously on Fantastic Mr. Fox and Moonrise Kingdom. It is co-produced by Anderson with music supervisor Randall Poster; they, too, worked together on Moonrise Kingdom. The original music is by Desplat, along with Russian folk songs together with pieces composed by Öse Schuppel, Siegfried Behrend, and Vitaly Gnutov, and performed by the Osipov State Russian Folk Orchestra. Wes Anderson and Randall Poster chose the distinctive sound of the balalaika to establish the musical voice of the film and managed to gather two orchestras for a total of 35 balalaika musicians for the recording of the soundtrack including the France-based "Saint Georges" Balalaika Orchestra [fr] and the State Academic Russian Folk Ensemble "Russia" [ru] from Moscow. Desplat’s use of the balalaika begins with “Mr. Moustafa” but it returns over and over again. Other instruments in this soundtrack include alphorns, whistles, organ, male choir, bells and cimbalom. The film was released on 7 March 2014 and was the opening film for the 64th Berlin International Film Festival in February 2014. At Berlin, the film won the Jury Grand Prix Silver Bear award. Film aggregator Rotten Tomatoes gives the film an approval rating of 91% based on 276 reviews, with an average rating of 8.4/10. The website's critical consensus states, "Typically stylish but deceptively thoughtful, The Grand Budapest Hotel finds Wes Anderson once again using ornate visual environments to explore deeply emotional ideas." Metacritic reported a weighted average score of 88 out of 100, based on 48 critics, indicating "universal acclaim". Many ranked it one of the best films of 2014. Todd McCarthy of The Hollywood Reporter gave the film a positive review, saying "In a very appealing if outre way, its sensibility and concerns are very much those of an earlier, more elegant era, meaning that the film's deepest intentions will fly far over the heads of most modern filmgoers." Dave Calhoun of Time Out gave the film four out of five stars, saying "The film's shaggy-dog, sort-of-whodunit yarn offers laughs and energy that make this Anderson's most fun film since Rushmore." Jocelyn Noveck of the Associated Press gave the film three and a half stars out of four, saying "In the end it's Fiennes who makes the biggest impression. His stylized, rapid-fire delivery, dry wit and cheerful profanity keep the movie bubbling along. Here's to further Fiennes-Anderson collaborations." Owen Gleiberman of Entertainment Weekly gave the film an A-, saying "I've had my Wes Anderson breakthrough – or maybe it's that he's had his. The Grand Budapest Hotel is a marvelous contraption, a wheels-within-wheels thriller that's pure oxygenated movie play." Joe Neumaier of the New York Daily News gave the film three out of five stars, saying "As with all of Anderson's films, the magic is in the cast. Fiennes, with his rapid-fire delivery and rapier mustache, is hilarious, dapper and total perfection." Peter Travers of Rolling Stone gave the film three and a half out of four stars, saying "It's a filigreed toy box of a movie, so delicious-looking you may want to lick the screen. It is also, in the Anderson manner, shot through with humor, heartbreak and a bruised romantic's view of the past." Kenneth Turan of the Los Angeles Times gave the film a positive review, saying "Anderson works so assiduously to create obsessively detailed on-screen worlds that the effect has sometimes been hermetic, even stifling. "The Grand Budapest," however, is anything but." Stephen Whitty of the Newark Star-Ledger gave the film three and a half stars out of four, saying "While Anderson delights in creating a fictional (but very real) mittel-Europe, he also does it with the craft of old Hollywood, using carefully made miniatures and handpainted backdrops." A. O. Scott of The New York Times gave the film a positive review, saying "This movie makes a marvelous mockery of history, turning its horrors into a series of graceful jokes and mischievous gestures. You can call this escapism if you like. You can also think of it as revenge." Peter Howell of the Toronto Star gave the film four out of four stars, saying "The entire movie is like a giant, elaborately decorated cake, created by this most exacting of film craftsmen. And how tasty it is!" Ty Burr of The Boston Globe gave the film three and a half stars out of four, saying "With The Grand Budapest Hotel, Wes Anderson is up to his old tricks but with a magnanimous new confidence that feels like a gift." Bruce Ingram of the Chicago Sun-Times gave the film four out of five stars, saying "It's quintessential Anderson, in other words, but also an unabashed entertainment. And that's something to see." Steven Rea of The Philadelphia Inquirer gave the film four out of four stars, saying "The Grand Budapest Hotel is by far the most headlong comedic affair in Anderson's canon. It's practically Marx Brothers-ian at moments. And Fiennes – who knew he was capable of such wicked, witty timing?!" Christopher Orr of The Atlantic gave the film a positive review, saying "The comedy in The Grand Budapest Hotel is among the broadest yet undertaken by Anderson. But amid the frenzied hubbub, there are intimations of a darker, sadder history unfolding." A.A. Dowd of The A.V. Club reviewed the film positively, saying "Anderson's latest invention, The Grand Budapest Hotel, may be his most meticulously realized, beginning with the towering, fictional building for which it's named." James Berardinelli of ReelViews gave the film three out of four stars, saying "It offers an engaging 90+ minutes of unconventional, comedy-tinged adventure that references numerous classic movies while developing a style and narrative approach all its own." Moira MacDonald of The Seattle Times gave the film three and a half stars out of four, saying "Every frame is carefully composed like the illustrations from a beloved book (characters are precisely centered; costumes are elaborately literal); the dialogue feels both unexpected and happily familiar." Colin Covert of the Star Tribune gave the film four out of four stars, saying "I'm not sure what the formal definition of a masterpiece is, but 'The Grand Budapest Hotel strikes me as something very close." Ann Hornaday of The Washington Post gave the film three out of four stars, saying "If Anderson buries relatively little moral substance under lavish dollops of rich cream, at least he, like his fascinating protagonist, sustains the illusion with a marvelous grace." Mick LaSalle of the San Francisco Chronicle gave the film four out of four stars, saying "The movie's sad undertone saves The Grand Budapest Hotel from its own zaniness – or better yet, elevates the zaniness, making it feel like an assertion of some right to be silly, or some fundamental human expression." ^ "The Grand Budapest Hotel (15)". British Board of Film Classification. 12 February 2014. Retrieved 12 February 2014. ^ a b "The Grand Budapest Hotel". LUMIERE. European Audiovisual Observatory. Retrieved 17 September 2015. ^ "Hollywood zu Gast in Görlitz" (in German). Frankfurter Rundschau. 20 February 2013. Retrieved 10 April 2014. ^ "Wes Anderson's The Grand Budapest Hotel to Open the 64th Berlinale". Berlin International Film Festival. 5 November 2013. Retrieved 13 February 2014. ^ a b c "World Premiere in Berlin: Studio Babelsberg Production The Grand Budapest Hotel to Open the 64th Berlinale". Babelsberg Studio. 5 November 2013. Retrieved 14 February 2014. ^ a b "World premiere of Wes Anderson's The Grand Budapest Hotel to open Berlinale 2014". Screen Daily. Screen International. 5 November 2013. Retrieved 14 February 2014. ^ a b MacNab, Geoffrey (30 December 2014). "Best films of 2014: From Boyhood to Mr Turner". The Independent. London. Retrieved 23 January 2015. ^ a b Catherine Shoard. "The 10 best films of 2014: No 9 – The Grand Budapest Hotel". the Guardian. Retrieved 23 January 2015. ^ a b "Best Movies of 2014: Our Critics Pick Their Favorites – Variety". Variety. 21 December 2014. Retrieved 23 January 2015. ^ a b Richard Corliss (3 December 2014). "Top 10 Best Movies". TIME.com. Retrieved 23 January 2015. ^ "Golden Globe: Birdman, Boyhood and Imitation Game Top Nominations". Variety. 11 December 2014. Retrieved 11 December 2014. ^ Ford, Rebecca (15 January 2015). "Oscar Nominations 2015: The Complete List". The Hollywood Reporter. Retrieved 15 January 2015. ^ "The 21st century's 100 greatest films". BBC. 23 August 2016. Retrieved 13 September 2018. ^ "Grand Budapest Hotel, The (2014)". Turner Classic Movies. Retrieved 5 April 2015. ^ "The Grand Budapest Hotel (2014)". British Film Institute. Retrieved 5 April 2015. ^ "Grand Budapest Hotel (2014)". AllMovie. Retrieved 5 April 2015. ^ Kemp, Stuart (5 November 2013). "Wes Anderson's 'The Grand Budapest Hotel' to Open Berlin Film Fest". The Hollywood Reporter. Retrieved 14 February 2014. ^ "Weltpremiere in Berlin: Studio Babelsberg Produktion Grand Budapest Hotel eröffnet die 64. Berlinale". DGAP Medientreff. 6 November 2013. Retrieved 13 February 2014. ^ "Rekordwert für den Deutschen Filmförderfonds". Bundesregierung – Federal Republic of Germany. 24 January 2014. Archived from the original on 16 August 2018. Retrieved 14 February 2014. ^ "Barney Pilling – Film Doctor Interview". Film Doctor. 23 February 2015. Retrieved 23 February 2015. ^ Ryan, Mike (29 September 2012). "Johnny Depp & 'The Grand Budapest Hotel'? Wes Anderson Says Actor Is Not In The Movie". Retrieved 6 September 2018. ^ Ferri, Josh (10 October 2012). "Angela Lansbury Checks Out of New Wes Anderson Movie The Grand Budapest Hotel". Broadway. Retrieved 6 September 2018. ^ Prokopy, Steve (17 April 2014). "Capone talks blood, vampires and cinematic playmates with ONLY LOVERS LEFT ALIVE star Tilda Swinton!!!". Ain't It Cool News. Retrieved 6 September 2018. ^ Rich, Katey (21 February 2015). "How The Grand Budapest Hotel Cast Its Most Challenging Role". Retrieved 6 September 2018. ^ a b "Spoiler Alert: You Can't Really Stay at the Real Grand Budapest Hotel (But We Can Tell You Everything About It) – News Watch". National Geographic. 27 March 2014. Retrieved 1 April 2014. ^ Roxborough, Scott (14 January 2013). "Wes Anderson Starts Shoot for 'The Grand Budapest Hotel' in Berlin". The Hollywood Reporter. Prometheus Global Media. Retrieved 14 October 2013. ^ Matt Zoller Seitz, The Wes Anderson Collection: The Grand Budapest Hotel (2015), p. 143. ^ The Wes Anderson Collection by Matt Zoller Seitz ISBN 081099741X "...the director shot his eighth feature, The Grand Budapest Hotel, in three different aspect ratios: 1.37, 1.85, and 2.35:1. The movie jumps through three time periods; the different aspect ratios tell viewers where they are in the timeline." ^ a b Mekado Murphy, You Can Look, but You Can't Check In, The New York Times, 28 February 2014, accessed 14 March 2014. ^ "Wes Anderson im Interview: Die Deutsche Bahn hat die besten Schlafwagen". Stern. 6 March 2014. Retrieved 10 April 2014. ^ "How a Viennese author inspired The Grand Budapest Hotel". Dazed. Retrieved 18 March 2014. ^ "Wes Anderson Takes Us Inside The Grand Budapest Hotel, His Most Exquisite Film". The Daily Beast. Retrieved 18 March 2014. ^ Anderson, L. V. (19 March 2014). "What It's Like to Bake Like Wes Anderson" – via Slate. ^ Sanders, Rachel. "How To Make The Starring Pastry From Wes Anderson's New Movie". www.buzzfeed.com. BuzzFeed. Retrieved 6 January 2015. ^ Bernstein, Paula (4 January 2015). "Wes Anderson's DP Robert Yeoman". Indiewire. Retrieved 6 September 2018. ^ "Der Filmtipp: Grand Budapest Hotel – bunt, schrill, bilderbuchmäßig". Retrieved 23 January 2015. ^ "LUXX Studios". Retrieved 23 January 2015. ^ "Alexandre Desplat – The Grand Budapest Hotel (Original Soundtrack)". Discogs. discogs.com. Retrieved 13 April 2016. ^ Phares, Heather. "Alexandre Desplat: The Grand Budapest Hotel: Original Soundtrack". Allmusic. allmusic.com. Retrieved 13 April 2016. ^ Davis, Edward (23 January 2014). "Alexandre Desplat & More: Wes Anderson's 'The Grand Budapest Hotel' Soundtrack Arrives On March 4th". Indiewire. Retrieved 30 March 2014. ^ "Stream Wes Anderson's The Grand Budapest Hotel Soundtrack on Pitchfork Advance". Pitchfork. 25 February 2014. Retrieved 30 March 2014. ^ Danton, Eric R. (18 February 2014). "Grand Budapest Hotel Soundtrack Relies On Original Music (Song Premiere)". The Wall Street Journal. Retrieved 23 February 2015. ^ "Exclusive: Pics Of Recording Sessions For Grand Budapest Hotel, Randall Poster Talks Score, Wes Anderson & More". 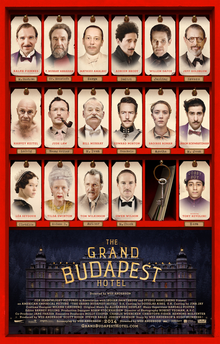 ^ "The Grand Budapest Hotel (2014) Full Cast & Crew". IMDb. ^ "'The Grand Budapest Hotel' raids Wes Anderson's vinyl collection for its rainy day playlist". ^ "The Grand Budapest Hotel – Alexandre Desplat". Retrieved 23 February 2015. ^ "ABKCO Records To Release Original Soundtrack To Wes Anderson's The Grand Budapest Hotel on March 4". Retrieved 23 February 2015. ^ Reed, Ryan (26 February 2014). "Stream Wes Anderson's The Grand Budapest Hotel Soundtrack". Rolling Stone. Retrieved 30 March 2014. ^ "Volksmusik CD Shop – Appenzeller Zäuerli – Öse Schuppel, Cat. Nr. 5112792". phono-schop.ch. Retrieved 23 January 2015. ^ "Wes Anderson's The Grand Budapest Hotel to Open the 64th Berlinale". berlinale.de. Retrieved 15 November 2013. ^ "The Grand Budapest Hotel Blu-ray". Blu-ray.com. 25 April 2014. Retrieved 30 April 2014. ^ "The Grand Budapest Hotel". 7 July 2014 – via Amazon. ^ McCarthy, Todd (6 February 2014). "The Grand Budapest Hotel Review". The Hollywood Reporter. Retrieved 16 March 2014. ^ Calhoun, Dave (7 March 2014). "The Grand Budapest Hotel". Timeout.com. Retrieved 16 March 2014. ^ Noveck, Jocelyn (5 March 2014). "Review: Fiennes shows comic chops in Anderson film". Boston.com. Retrieved 16 March 2014. ^ Gleiberman, Owen. "The Grand Budapest Hotel Movie Review". EW.com. Retrieved 16 March 2014. ^ "'The Grand Budapest Hotel': Movie review". New York: NY Daily News. 6 March 2014. Retrieved 16 March 2014. ^ Travers, Peter (6 March 2014). "'The Grand Budapest Hotel' Review". Rolling Stone. Retrieved 16 March 2014. ^ Turan, Kenneth (6 March 2014). "Review: Wes Anderson makes 'The Grand Budapest Hotel' a four-star delight". latimes.com. Retrieved 16 March 2014. ^ "'The Grand Budapest Hotel' review: No reservations". NJ.com. 7 March 2014. Retrieved 16 March 2014. ^ Scott, A. O. (6 March 2014). "Wes Anderson's Grand Budapest Hotel Is a Complex Caper". The New York Times. Retrieved 16 March 2014. ^ "The Grand Budapest Hotel a delicious cinema cake: Review". Toronto: Thestar.com. Retrieved 16 March 2014. ^ Burr, Ty. "Movie review: Wes Anderson's imagination checks into The Grand Budapest Hotel". Boston.com. Retrieved 16 March 2014. ^ "The Grand Budapest Hotel: Wes Anderson as crowd-pleaser". Suntimes.com. Retrieved 16 March 2014. ^ Rea, Steven (22 October 2012). "Anderson at his best in 'Grand Budapest Hotel'". Philly.com. Retrieved 16 March 2014. ^ Esfahani, Emily. "The Sober Frivolity of The Grand Budapest Hotel". The Atlantic. Retrieved 16 March 2014. ^ Dowd, A.A. (6 March 2014). "Wes Anderson erects The Grand Budapest Hotel, a delightfully madcap caper · Movie Review". Avclub.com. Retrieved 16 March 2014. ^ "Reelviews Movie Reviews". Reelviews.net. 12 March 2014. Retrieved 16 March 2014. ^ Macdonald, Moira. "The Grand Budapest Hotel: It's a trip". The Seattle Times. Retrieved 16 March 2014. ^ "'Grand Budapest Hotel' offers many delights". Star Tribune. Retrieved 16 March 2014. ^ Hornaday, Ann (13 March 2014). "The Grand Budapest Hotel movie review". The Washington Post. Retrieved 16 March 2014. ^ LaSalle, Mick (13 March 2014). "'Grand Budapest Hotel' review: Wes Anderson at his best". SFGate. Retrieved 16 March 2014. ^ a b "Grand Budapest Hotel overtakes Need for Speed to cruise into top spot". The Guardian. Retrieved 31 March 2014. ^ "Weekend Box Office Results for March 7–9, 2014". Box Office Mojo. Retrieved 30 March 2014. ^ "Weekend Box Office Results for March 14–16, 2014". Box Office Mojo. ^ "Weekend Box Office Results for March 21–23, 2014". Box Office Mojo. Retrieved 26 March 2014. ^ "Weekend Box Office Results for March 28–30, 2014". Box Office Mojo. Retrieved 1 April 2014.